Place the fresh turmeric into a small bowl of a food processor and chop well. Pop into a large saucepan. Then add the ginger to the processor, chopping and place in the saucepan with the turmeric, the tamarind puree and 1 litre of filtered water. Bring to the boil, reduce heat and simmer for about 15 minutes. Allow this to cool a little, before straining into a glass jug, removing all the chunks of ginger and turmeric. Lastly, add the honey, 1 dessertspoon at a time, taste testing after the first spoonful to double check sweetness before adding more. 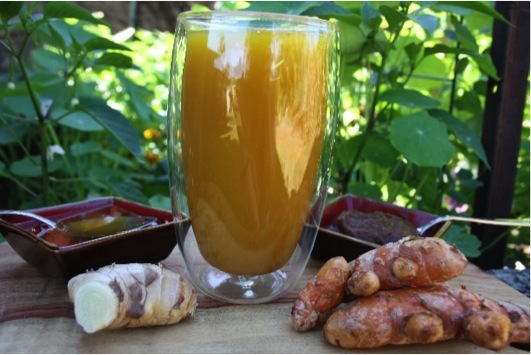 Because of the high amount of turmeric in this, store in a glass jar to prevent staining of your equipment. I have been served this both as a cool drink and warmed, and I must say I did prefer it warmed. Very soothing… You could also experiment by adding a little cinnamon, nutmeg or cloves.